WE SHALL ASSUME FROM THE BEGINNING that you are a licensed acupuncturist or a medical doctor, or some other type of "healer." We shall also assume that you plan to address spiritual matters with your patients or clients. The patient or client will come to you and will display symptoms that indicate a difficulty that lies somewhere outside the normal diagnostic and treatment methods that you have been taught or that you have learned by your own efforts. Or perhaps they will come right out and ask for help in spiritual or holistic areas. What is it that you will do? Successful treatment requires a proper diagnosis, and vague concepts of "neurotic behavior" or "Shen (spirit) disturbance" are not going to help us much when we go venturing into the depths of investigation set forth in this course. A PRACTITIONER of spiritual arts is expected to be spiritually advanced in relation to his or her clients. Ultimately, the higher states of consciousness show us that there really is no such thing as one person being spiritually advanced over another person. But from our ground-level viewpoint, we shall define "spiritually advanced" as meaning in a more expanded and energetic level of consciousness than the person being treated. It is doubtful that you will be spiritually advanced in relation to your patients unless you have a history of spiritual discipline, including some type of meditation practice. Spiritual Acupuncture is not a process wherein special points are activated and the patient automatically receives illumination (Oh, this does happen sometimes, but rarely!). You, the practitioner, must be in an expanded state of awareness so that you might guide the patient into those areas where they want to be. If you don't have control of your own consciousness, if you don't have a history of meditation, psychic development, or other spiritual discipline, then you probably won't be able to get the dynamic results of Spiritual Acupuncture. However, you may still benefit by the techniques described in this book, especially if you start or renew a spiritual discipline schedule. If you have been studying spiritual matters and performing some type of spiritual discipline, most of the concepts and techniques in this book will be easy to understand. Now, let us assume the patient or client appears and makes a request for spiritual treatment. After you have performed your customary type of initial diagnosis, what method will you utilize to obtain a "Spiritual Diagnosis?" If you are competent in aura reading, channeling, or divination, then you are prepared to move forward. If you are not familiar with these concepts, or if you require further information regarding them, we will now address the Aura as well as I Ching Divination. In order to perceive the auric energy fields, you must see them or sense them in some other manner. The etheric aura is particularly easy to see; the more expanded fields are particularly difficult to see. In order to see any of these fields, your vision must be "seeing" at the same level. Thus, to see the Causal aura, you must be in Causal consciousness (refer to the "Levels of Consciousness" chapter); this can be difficult. It is possible to perceive these fields through sensations in your palm, and this technique is not difficult to learn. THE ETHERIC PHYSICAL BODY is not directly perceptible by normal sensory methods. This etheric body is the location of the acupuncture points and channels. The etheric body is composed of what the Oriental Sages call Nadis, or "Lines of Force." The dense physical body is built upon the etheric network made up of the Nadis. The etheric vehicle is the blueprint that governs how our physical bodies are built, how well they function (including healing and repair), and what we look like in human form. Where two Nadis cross, we have an acupuncture point; where seven Nadis meet, we find a plexus; where twelve or more Nadis intersect, we find a Chakra (center). The etheric body is the same size and shape as the dense physical body, but it is slightly larger. That is, it radiates from 1/8" to 1" beyond the surface of the skin. In the average person, this radiation is about 1/4". In persons with a strong healing potential, this radiation will be 3/4" or more. When viewed in dim light with a dark background, this radiation appears as a gray mist. When viewed in strong light, it appears like "shimmering heat waves coming off a highway at noon in summer." The etheric radiation corresponds directly to what scientists call GSR (Galvanic Skin Resistance); GSR is what lie-detector instruments measure. This radiation also corresponds directly to the Oriental Medical concept of Wei Qi (Defensive Vital Force). The stronger the etheric radiation, the stronger is the person's outer immune system and healing ability. The etheric radiation is always disturbed over a deficient, or excessive area in the dense physical body. As a means of introducing a technique for locating disturbances in the etheric radiation, I would like to call your attention to the area of the human body that lies between the umbilicus (navel) and the sternocostal angle (at the bottom of where the lower ribs meet). Scientifically, we refer to this as the epigastric area, and commonly we call it the stomach area. Acupuncturists know that the midline of this epigastric area is the location for acupuncture points eight through sixteen on the "Conception Vessel" (Ren 9 to Ren 16), and that these points are utilized for regulating stomach and digestive processes, water metabolism, and the heart. The etheric body is structured in such a fashion that the Solar Plexus chakra (center) is located in this area. The Heart chakra, of course, is located higher in the body, behind the sternum. The Solar Plexus is primarily concerned with the preliminary digestion of food and the regulation of emotions, these being functions attributed to the stomach/spleen and the liver. 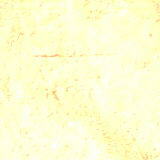 The Solar Plexus contains and radiates the personal, emotional energy generated by desire. The Heart center houses the Shen, the consciousness. When it is operating correctly, it radiates a golden light akin to the Sun, and like the Sun it radiates equally in all directions and illumines all beings and objects. This is the definition of the much-used term, "Unconditional Love." The physiology of the etheric body and the chakras is such that the Solar Plexus should not radiate its personal desire energy, but rather that this center should act as a reservoir of energy that is used to fuel the Heart center. The Heart center should receive this "personal" energy/fuel and convert it into golden sunlight. The image of a kerosene lamp is quite appropriate to explain this process, with the kerosene-containing base equivalent to the Solar Plexus center, the burning flame inside the glass chimney equivalent to the Heart center, and the wick equivalent to the channel that should conduct the energy upward to fuel the flame in the Heart. The channel that conducts this "fuel" up to the Heart is often blocked in our patients; in fact, over 99% of the general population suffers from some blockage in this channel, and the nature of the blockage is complexes of repressed, personal, emotional energy. In order to treat this very common condition, a single needle is placed in the precise center of the blockage. However, this precise center can be located anywhere from Ren 9 up to Ren 15, or any place between the two, and is not limited to the textbook location of any given point or extra point. This precise point is similar in nature to Nogier's "Point Zero" of auriculotherapy, and is has been designated as the "Soma-Zero" point as it balances and harmonizes the effects of all other needles placed in the body. Complicating matters considerably is the fact that this Soma-Zero point is variable in its location according to the patient's immediate physical and emotional condition. In fact, it can move as much as two inches in location within a day or two. Thus, we must be equipped with a method for locating this elusive point in any given moment. There are at least two methods for locating specific points, one of which is easily learned and the second a bit harder to master. The first method involves point location by physical sensation in the palm of the hand. By passing the palm (Pericardium 8) over the skin at a height of about two inches, one can sense either the heat or the electrical energy of the points; the Soma-Zero point is the coldest point between Ren 9 and Ren 15, or it is the point that is radiating the most discordant energy from the epigastric midline. This method is usually quite easy to teach in the classroom or clinic. The second method involves seeing the point with the etheric vision, and requires the ability to see the auric fields; it is much more difficult to teach this method. If you engage the Soma-Zero point correctly, the chances are your patients will be quick to make comments regarding the increased effectiveness and power of your treatments. LOOKING OUT to the side of a person, a band of colored light begins. It extends for about 18". 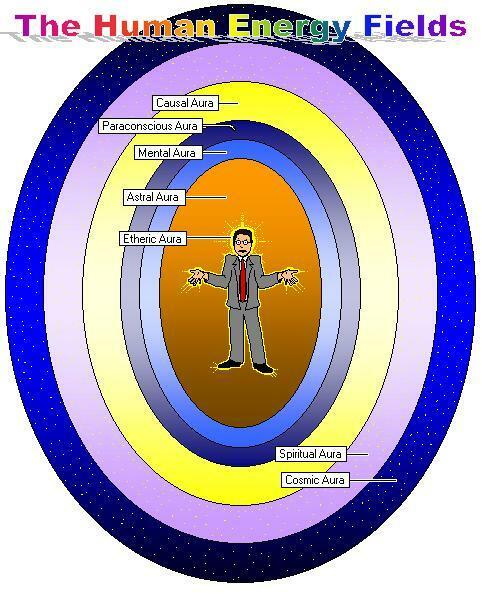 This is the astral auric field. Remember, this energy field (as well as the others) extends beyond the physical body, and at the side of the patient it is most easily seen. But it really is an egg-shape, and it penetrates through the dense physical and etheric bodies. The astral energy field is also called the emotional body. It changes constantly and quickly in relation to changes in mood or emotional state. The colors here are bright, moving, and can be bewildering. Practitioners have counted up to 54 different interwoven colors dancing around at one time in this field. Please do not confuse the "Astral Body" mentioned above with the Astral Body one uses in Astral Projection, or out-of-the-body experiences. Please see the chapter on "Astral Projection." THE MENTAL AURA extends about 12" in all directions beyond the outer edges of the astral auric field. The mental aura is quite stable, and usually has one of two colors as its background. A blue background indicates an analytical mind, which is found in most males. It is characterized by the ability to mentally separate a problem from the total contents of a life situation, to analyze (break down into component parts) that problem, to put it back together again, and then to re-integrate it into the whole again. A green background indicates a manipulative mind, which is found in most females. It is characterized by the ability to mentally balance a problem with the total contents of a life situation, finding a balance without analysis, and without loosing awareness of the whole. Virtually every person with a blue background has an "outer ring" of green, indicating that they are able to interface with the world around them (a pure blue background would be a person who is so analytical that they never stop to consider other people or the overall situation - They cannot see the forest because they are mentally wrapped up in one or two trees). Conversely, almost every person with a green background has an "outer ring" of blue, indicating that they are able to interface with the world around them (a pure green background would be a person who is so manipulative that they never stop to consider details and are unable to analyze specific situations - They cannot see any given tree because they are mentally wrapped up in the forest). THE PARACONSCIOUS AURA extends in all directions beyond the outer edges of the mental auric field. The paraconscious aura is quite stable, but changes slowly as a person moves forward on their spiritual path. This field is called the "paraconscious" because it is next to (para = "next to") the conscious mind. It is just beyond the normal scope of consciousness in most people. It tends to produce elaborate visions when the practitioner merges his or her consciousness with another person. These visions include symbols that, when interpreted, will tell us how "rough" a path the soul has set forth for the person, when major changes in lifestyle or awareness took place - or will take place, the evolutionary status (initiatory level, if applicable) of the person, and how well or poorly they are accepting or synchronizing their lower consciousness with their appointed path. THE CAUSAL AURA extends about 8" to 12" in all directions beyond the outer edges of the paraconscious aura. The causal aura is very stable, only changing slowly as a person resolves problems (karma) and moves upward on their spiritual path. The causal aura is quite difficult to read, even for an experienced aura reader, for the reader must be in causal consciousness in order to accurately perceive this auric field. The causal body is the realm of the Soul. This has also been called the "reincarnating ego," for it is to the Soul that the physical, emotional, and intellectual essences return upon death. This is also the field or body wherein forms are "stored" that pertain to karmic issues. Karma is the Law of Cause and Effect. When a person gets off-balanced due to thoughts, words, and deeds, their causal "bank account" is debited. When a person redresses off-balanced thoughts, words, and deeds, their causal "bank account" is credited. THE AURA is an outflow of ionized energy from the etheric network and consciousness of the individual. Healers who claim to heal by "aura adjustment" are merely rearranging this outflow of energy, and it doesn't last very long! The aura is like the light that comes from a light bulb; you can paint the bulb, or cover it, or conceal it under a lampshade, but nothing you can do will alter the fact that the light is being generated by electrifying a tungsten filament in a vacuum with 117 alternating current volts, and that the resultant outflow is radiating at so-many cycles per second in the visible light range. The true healer adjusts matters at their source, and this implies that the patient must make internal changes in lifestyle and/or consciousness. It is like changing the voltage going into a light bulb, modifying the filament, or introducing an inert gas into the vacuum of the bulb. By the way, if we are to be honest, it must be stated that no healer ever heals another person. 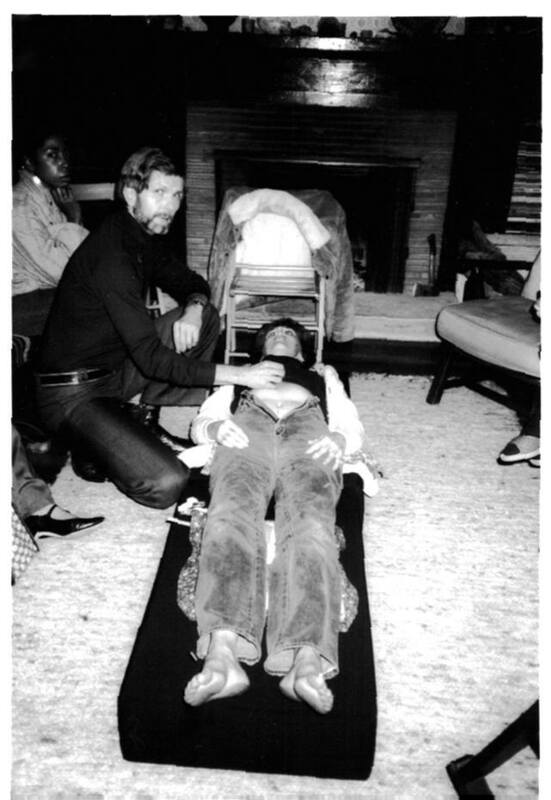 Healers, through their techniques, introduce a higher state of energy into a diseased area, thus allowing that area to clear itself. If the person then goes out and performs that action that caused the problem in the first place, then the problem will re-appear. Healers of all categories have a three-fold task set before them: (1) To accurately diagnose the problem, (2) To explain the problem to the patient, giving recommendations on how to clear or avoid the problem, and (3) To use their special techniques to balance the problem while the patient undertakes the task of self-healing. The aura is an outflow of energy. The inflow is the Ray. The ray is a funnel-shaped (upside-down cone) input of energy that enters every person at the crown (Du 20). It comes in to everyone as white light, but when it impinges upon the causal aura in its downward direction, all the colors contained in the causal aura (past actions) are "subtracted," and the result is the color(s) needed to attain pure, white light. This is how "life purpose" can be determined. It is those colors needed to attain "white light status," translated into action. As a person performs the required action, the ray color(s) become more subtle; but the ray type never changes within a given lifetime. The ray is exceedingly difficult to see. However, since the combined input voltage and current (the ray) of an electrical circuit is always higher than the outflow (the aura), the ray can sometimes be seen under the most normal circumstances. If a person catches a fleeting glimpse of a bright, subtle light around or (especially) above the head, it is probably the high voltage ray energy shining out through all the lower auric fields. Rays are quite beyond the scope of this course, but they are mentioned in order to give a complete picture of the human energy system. The Causal Aura, with its inherent ray, is the outer limit of our endeavors in many ways. It is actually beyond normal human consciousness limits. As spiritual practitioners, we must exceed those normal limits and attain to the "knowledge and conversation of the Holy Guardian Angel," that is, we must ourselves aspire to enter causal consciousness at will. Then, it becomes our duty to enter this consciousness on behalf of our patients, and to somehow aid the patient in making conscious causal contact themselves, even if only for an instant. This is the source of all holistic healing; without this, we cannot consider the healing to be "holistic," for that term implies a "wholeness," a linking of all levels of consciousness, up to and (especially) including the causal/soul body. To move upward and outward in consciousness from the causal level is to enter the Abyss. And one cannot enter the Abyss without "tearing" the outer envelope of the causal aura. The causal aura is a protective mechanism, designed to keep trans-carnation consciousness intact. To transcend the causal body and enter the abyss is a one-way journey. The tearing and burning-off of the causal body subjects the individual to the destructive forces of the Abyss; for anything that contains an awareness of a self that is separate from the rest of the Universe, and that is not protected by a causal envelope (the "Solar Angel), will be utterly annihilated in the abyss. Those who have entered the Abyss [mystics call it "the dark night of the soul," and who have had all sense of separate identity destroyed, have crossed over to the other side - to the realm of Universal consciousness. And then they return, but they no longer are motivated by personal desire, or even causal karma, for they are instruments of the Universal consciousness. Such have been called saints, masters, bodhisattvas, or adepts. It should be emphasized that people do make this attainment, and they do return to the three-dimensional world. 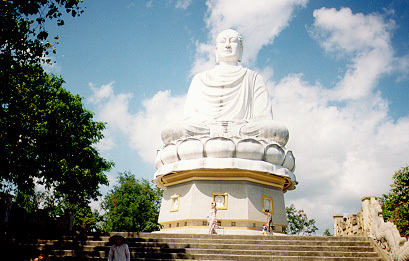 Don't expect them to necessarily behave in a manner consistent with your concepts of a "saint" or "master," for the following principle applies: A master is not a master unless he or she is functioning in his or her Body of Light; otherwise they are human, and subject to the usual ills and problems which face all of humanity. To "function in the Body of Light," implies being in a Universal meditational state (Samadhi or Satori or One with the Tao). The spiritual path is never an escape from ground zero. Many (most) people treading the spiritual path assume that some day they will make a final attainment, and that their life will be magical and heavenly thereafter. Nothing could be further from the truth. The Buddhists have a saying that sums this matter up: "Before enlightenment, chop wood, carry water. After enlightenment, chop wood, carry water!" The causal level is also the highest consciousness that the average person can understand without becoming confused or bewildered. It is enough to identify the Physical, Emotional, and Mental levels, to which we might add the concept of the Soul or Higher Self. Most people can understand that easily enough. It is our job to assist people in connecting with their causal consciousness. Beyond that, they are in little or no need for assistance or guidance from other human entities, for they have the guidance of their own Solar Angel. BEYOND the blazing limit of the causal aura, and it does blaze and radiate in dynamic, metallic colors at the edges, lies the Spiritual Aura. There are two levels here, called the Spiritual and the Cosmic. Not everyone has an active energy field beyond the causal aura. Those who show activity in this area have certain characteristics in common: (1) They do not feel comfortable with life on planet Earth, (2) They do not think like most of their fellow humans, and (3) They exhibit some psychic power or unusual mental ability. It is a case of being a "stranger in a strange land." No matter what they do, they cannot escape the fact that they do not share a common evolutionary background with their fellows. "Walk-ins" claim to be visitors from another realm who have taken possession of a human body (usually with the permission of the previous inhabitant who wanted to leave anyway). Let us consider that there are no walk-ins, but rather that they are "wake-ups." Countless mystics down through the ages have written of how their spiritual endeavors brought them to a point where they no longer existed, and something else took over. Contrast this concept with the description of crossing the Abyss (above). It seems likely that most self-proclaimed walk-ins are people who made this transference of consciousness from the personality or soul to the Higher Self above the Abyss, and then choose to claim extra-terrestrial takeover status. In fact, it only seems like it is a separate extraterrestrial entity, for it is simply their "waking-up" to the consciousness of the spiritual aura/body that was already there before they were born. THE I CHING is an ancient text, one of the classics of Oriental philosophy. It was often used in making Imperial governmental decisions. Even after the communists took over mainland China, the I Ching was still studied by students in primary school. It is a philosophical system as well as a method of divination, applicable to all life situations. To utilize the I Ching as a divinatory system, one enters a meditative state and concentrates upon a situation, place, person, or concept, or asks a question relating to the problem, and then manipulates a set of 50 yarrow stalks, a set of six painted sticks, a set of six coins, or a set of three coins. The patterns formed by the stalks or coins is then translated into lines that form a hexagram that is composed of varying combinations of yin and yang energy. One then refers to a competently translated text of the I Ching to receive an interpretation of the true nature of the problem. There are several ways to manipulate the stalks or coins, depending on the text one is following. There are also different ways of determining where the emphasis is within the hexagram, usually determined by the "moving lines." These are yin or yang energies within the situation (hexagram) that are ready to turn into their opposite and thus change the situation. This is important, for I Ching means "The Classic of Changes." What really matters is that you make an agreement with yourself (or between yourself and the I Ching) as to how the stalks or coins will be manipulated and interpreted. The entire process is based on "synchronicity," which means the pattern of stalks or coins is "synchronized" with your specified situation. In fact, the stalks or coins can only produce a single pattern in relation to a given situation. There is no need to go into the details of manipulation and interpretation, as each text usually contains this information. However, also see "Method of the I Ching" in the Lecture on "Techniques." This is what the I Ching had to say about Spiritual Acupuncture: "Proper discipline should be used; The right balance brings good results." This divination speaks for itself. It is also appropriate to consult the I Ching for medical diagnostic purposes, but one needs a copy that has been interpreted for Oriental medical uses. Shima, Miki, OMD published a Medical I Ching through the Japanese-American Acupuncture Foundation in 1988. THERE ARE COUNTLESS OTHER METHODS that can be utilized for diagnostic purposes. Astrology (Western and Oriental), Numerology, the Tarot, and the Pendulum are but a few. We trust you will have attained to a measure of competence in your chosen divinatory methods before you begin treating patients. Practice your method until it becomes natural: then practice with friends or volunteers; finally, extend your divinations into your practice. It is not usually wise to perform divinations in front of your medical patients as the average person will probably not return. Patients seeking Spiritual Acupuncture are often a different manner, and they will usually participate fully and enthusiastically in the process. If you're not sure whether or not to openly display your divinatory methods, why don't you ask the I Ching?